If you’ve not come across the baking challenge Alpha Bakes, you may have had less of a headache than I did recently. A random letter is generated each month and we have to find something to bake where a main ingredient or name begins with that letter. When it happens to be C there is no problem for me – everything I bake has chocolate in it, but when it’s something a little more obscure such as Z, it becomes difficult. This month’s letter is K. Initially, kiwi fruit came to mind. When I looked in my recipe books, however, I found a few obscurely named recipes beginning with K, but nothing with kiwis. Despite the damage done by pigeons, kale is one of the few crops we’ve managed to grow this year and having initially dismissed this as an ingredient, I decided I really wanted to use some in a bake. Once I’d decided that, it was easy. I resorted to my trusty savoury brunch muffin recipe and adapted it to suit. 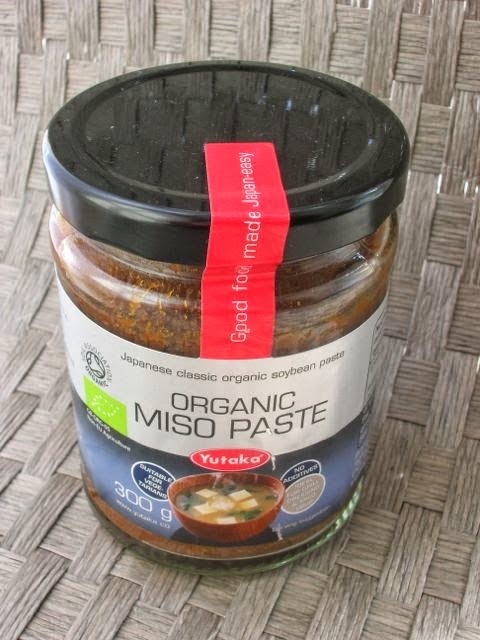 It just so happens (and in a timely manner for #OrganicSeptember), that I was sent a jar of Yutaka organic classic miso paste to try out. Miso is no stranger in this household and we have been using it for more years than I care to remember. We make miso soup, use it instead of stock in our other soups and sometimes just drink it with hot water in a mug. It’s meant to be incredibly good for you. However, other than soup, I’ve not been very adventurous with it. So why not try it out in muffins I thought? As soon as the idea crossed my mind, I knew it was a good one and I was right. The umami flavour it gave to the muffins was perfect. Miso has this uncanny ability to bring out the flavours of other ingredients and that’s exactly what it did here. For those not in the know, miso originates from Japan and is a paste made from fermented soy beans and grains. It’s full of umami flavours and is a fabulous ingredient for all, but especially vegetarians and vegans. It’s quite salty so a little goes a long way. We always buy an unpasturised version so we get a dose of the beneficial enzymes which are destroyed by the pasturisation process. We add it to soup after it has been taken off the heat and has stopped bubbling. This jar of Yutaka organic miso paste has no information regarding pasteurisation, so I have to assume it has been treated. As I was baking with it, this didn’t really matter. The strap line on the jar reading “good food made Japan-easy” made me laugh. It is available via Sainsbury’s and costs £2.99. Do Miso Muffins Need Cheese? The short answer is no, not really. Miso contains enough umami and goodness in its own right and doesn’t need cheese thrown in as an extra. But I had some goat’s cheese in the fridge which was crying out to be used. So I sliced it on top to give a nice crusty surface and it did make for an extra level of yumminess. I probably didn’t need to add the cocoa either, but these just wouldn’t be my signature brunch muffins without it. Thanks for visiting Tin and Thyme. If you make this easy recipe for miso muffins with extra veg, I’d love to hear about it in the comments below or via social media. Do share photos on your preferred social media site and use the hashtag #tinandthyme, so I can spot them. For more delicious and nutritious recipes, follow me on Twitter, Facebook, Instagram or Pinterest. 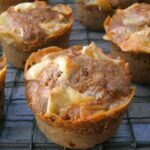 Ideal for breakfast, brunch or lunch boxes these savoury muffins are very tasty and packed full of goodness. They're also simple to make. Mix the miso with a little of the yogurt, then mix in the rest along with the oil and milk. Sieve the dry ingredients into a bowl and stir in the kale, carrot, courgette and garlic. Make a well in the centre. Break in the eggs and stir from the middle outwards, gradually adding in the yogurt and miso mixture until everything is just incorporated. Divide the mixture between 12 large silicone muffin moulds. Cut the cheese first into 12 and then each piece into three or four. Lay these pieces on top of the muffins. Bake at 180℃ for 30 to 35 minutes when the muffins should be well risen and the cheese golden. Remove from the oven and turn out onto a wire rack to cool. K is for Kale for Alpha Bakes over at The More Than Occasional Baker and Caroline Makes. 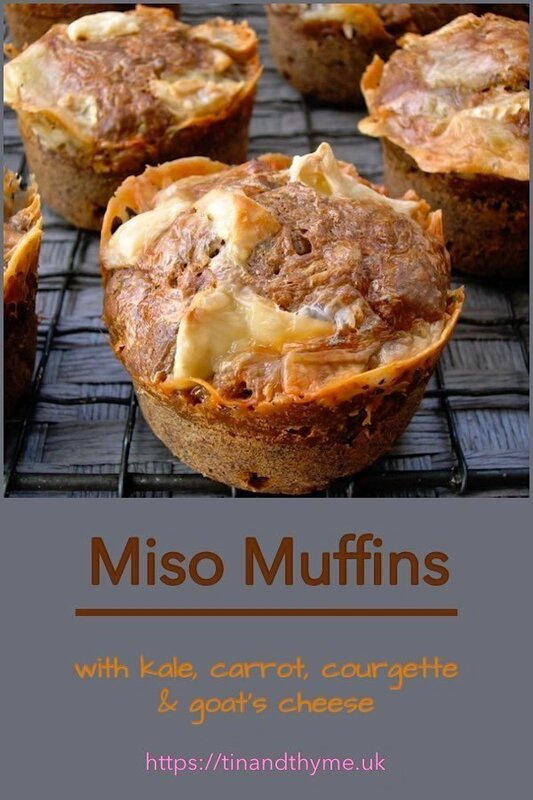 The goats cheese used in these miso muffins nearly ran out of the fridge, it was so desperate to be used. So I’m entering them into the No Food Waste challenge. This is a monthly event coordinated by Elizabeth’s Kitchen Diary. In addition to the cheese that needed using up, we grew the kale, carrot, courgette and garlic that went into these miso muffins. This made them even tastier as well as suitable for Credit Crunch Munch. Hosted by Fab Food 4 All and Fuss Free Flavours, you’ll find it this month over at Maison Cupcake. I was sent a jar of miso paste to try. I was not required to right a positive review and as always, all opinions are my own. Thank you for supporting the brands and organisations that keep Tin and Thyme blithe and blogging. Wow these sound amazing! I love your stuff! Am SO intrigued by these C. I want to hate them but I know I’d love them. You’re such a gastronomic rebel! Very interesting Choclette. 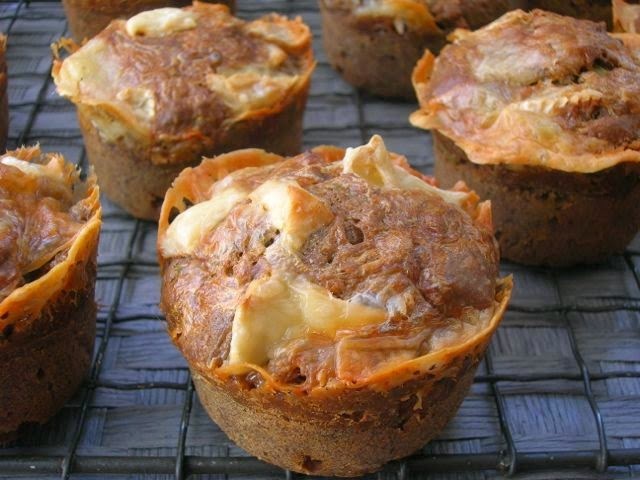 Just like a savoury chocolate carrot cake muffin so I’m in! This is such an interesting and creative combo of flavours. These muffins look wonderfully delicious, Choclette. Thanks Angie – they were very tasty and not too naughty either. What an interesting combination of ingredients and flavours.Very innovative. Oh please do dare, it gives such a delicious savoury taste. I’ve been making lots of savoury muffins lately. They make such a change to bread. Bet these would be great cut in half, toasted and slathered with butter!! I only wish I’d read your comment before finishing the last one Kate – I so want one toasted and slathered in butter now. Thanks Melissa – they are fabulous for packed lunches or picnics. Wow these look so yummy! You would have never thought they would be healthy for you! Sadly sugar is the biggest culprit Laura and at least these don’t have sugar in them and do have veg and a few other good things. Love miso, love kale, love savoury muffins. Genius. Thanks Nazima – would never have thought of having these with soup, but what a splendid idea. Thanks Elizabeth – intriguing in a good way I hope! These sound delicious, I’d have miso in every meal given half a chance! I’ve just discovered a brilliant asian supermarket in Lincoln that sells it cheaply too – it’s one of those ingredients I have a hard time justifying when all I could find locally was the itsu brand – about £4 for three teeny tiny sachets! Glad you’ve managed to find a reasonable source Rosemary. We’d find it very hard to live without miso and tend to buy a large kilo tub whenever we come across one to ensure we don’t run out. Thanks Ros – they were rather scrummy. Never come across miso in a muffin but I bet it tastes wonderful. I always prefer savoury muffins to sweet ones anyway. I’m with you Sarah on the savoury versus sweet muffins. Coming over now to check out the round-up. Well I should have guessed you’d be there before me Johanna and with pumpkin thrown into the mix, I bet those muffins were scrumptious. Thanks for linking up with the No Waste Food Challenge too – just catching up on commenting now! I know Elizabeth, it’s hard to keep up.